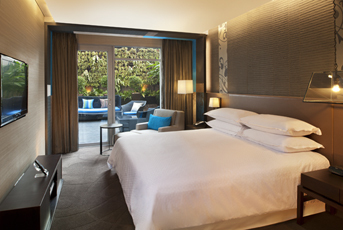 Enjoy a free night with every 2 paid nights at the Four Points by Sheraton Hotel in Bangkok. Rates for the payable nights start from THB3,300 (USD106) for a Comfort Room with your choice of two queen or one king bed. The 3rd night will be completely free. A 10% service charge and 7% taxes are additional. The “Buy 2 Get 1 Free” promotion must be booked by June 30 for stays through December 20, 2012. The “Buy 2 Get 1 Free” promotion is also available with other room types. Rates are THB4,800 (USD155) for a Studio Suite, THB6,300 (USD200) for an Executive Suite, or THB7,300 (USD235) for a Terrace Suite. Rates are based on single or double occupancy. This promotion requires full pre-payment by credit card and no refunds are permitted. 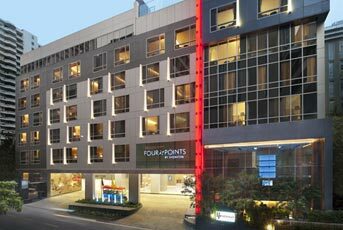 The Four Points by Sheraton, Sukhumvit 15 is an up-scale hotel located in downtown Bangkok. The hotel offers 268 guestrooms and suites with a modern style and amenities including LCD TV and DVD player, comfortable work desk, and luxurious bathroom with separate shower and bathtub. Hotel facilities include a 24-hour fitness center, outdoor swimming pool, rooftop bar, and restaurants. 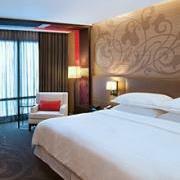 Visit www.starwoodhotels.com/fourpoints/bangkoksukhumvit15 for more information or to make an online booking. The hotel can be contacted by calling (66) 2 309 3000 or emailing fourpoints.sukhumvit15@fourpoints.com.